Okay, so I'm back with yet another update on my dollhouse project. Which let me tell ya, just keeps getting better and better. And I'm so happy that I've been taking my time with it, because I want this dollhouse to reflect a part of me. This is what I see my future farmhouse cottage eventually looking like, one day, because this girl has dreams. Except I'm also working with things and items that I already had or went out and found on the cheap aka bargain! So maybe not exactly how my future house looks like and more of how we're creating our home now, with all the budget friendly tools. I want this dollhouse to have all the cottage coastal farmhouse feels. Because I am a southern California native and love architecture and making a home feel cozy and neutral, I wanted the floors to really be the impact of the indoors. You guys know I love dark wood floors, they're in our house originally and therefore when I found this drawer liner at the dollar store with the dark wood pattern, I couldn't resist. I bought this roll, probably almost 1 1/2 ago knowing that I would one day use it in my dollhouse. I told you guys, I had this dollhouse on my mind before I even found it. But I knew that eventually I would. The drawer liner that I placed on both the attic and living room of the house, did bubble up a little bit so I had to make sure to glue it down in most areas. Its not perfect, but the imperfections will get covered by furniture and things. For the bedroom flooring I used Popsicle sticks I bought a couple of packs at the dollar store. This was the first floor that I worked on and originally wanted to do the whole house this way but unfortunately the cutting of the Popsicle sticks was wayyyy to time consuming and would've taken forever to finish. I just didn't have the patience. Not to mention it was a bit painful on my hands eventually. Once those were glued down and fully dry, I went ahead and added a clear satin varnish to seal them. I already had the varnish from previous projects but you can find this exact one at your local Michael's. This is the view from the front of the dollhouse, which I love what a difference it makes to have floors finally finished. Means we can now move on to some more fun stuff. Like furniture and decor. As you can see I've continued to add to the outside of the house with the finished balconies, I'll be posting about that soon, but I'm still working on the window boxes. Both the kitchen and bathroom I did the same tile vinyl flooring as well. I didn't want to fuss looking for a different pattern and I wanted to use up the whole sheet that I bought and since I most likely won't be using any leftovers on anything else. Here's a breakdown of the supplies I used and bought for the flooring in each room. Bedroom - Popsicle sticks, cut in different sizes to fit and clear satin varnish to seal. I used Original Tacky Glue to glue everything down. I hope you guys are still interested in seeing more progress, I know I am. I'll keep sharing as much as I can and remember to do, but the best part will be the final reveal especially for me. Although I'm still on the search for a few special pieces. I am starting in the kitchen, so stay tuned. 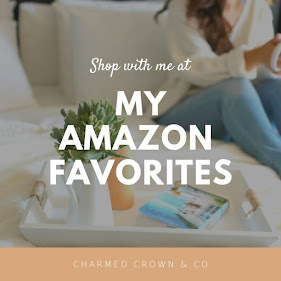 To check out more of my creative DIY, party crafts, recipes and more, visit my blog CharmedCrownBlog.com or follow me on Instagram @charmedcrownblog!